Comfort Italian food? Oh, yes! Italian immigrants played a big role in creating the USA as we know it, so it is not surprising that Italian food is one of the most popular here – and yes, more often than not, it falls in the category of “comfort food”. For example, pasta and meatballs – isn’t that just a different way to spell “comfort”? Or how about pizza? Or anything with mozzarella, the word which non-Italians can’t even pronounce in a tasty way (it is “mozzarell” to you! ), wouldn’t copious amounts of mozzarella make any dish a comforting one? Can the food be comforting and classy at the same time? Why not? There are many ways to add a classy element to the comfort dish – presentation might be the simplest one. Or you can just add a tasty cocktail or a glass of wine to the same dish, and all of a sudden you have the next level of experience. Bar Zepoli has one of the most central restaurant locations in Stamford, right in a middle of the “restaurant district” if Stamford would ever designate one. The restaurant is technically located inside the Marriott Courtyard hotel, but it is easily accessible right from the street without the need to navigate the maze of the hotel and its self-focused guests. Once you walk inside, dark paneling and dim lighting quickly get to you to quickly install “yep, this is comfortable” mood. As usual, we started with the cocktails. The Pear Bears Margarita (Reposado Tequila, Pear Syrup, Honey Triple Sec, Cinnamon sugar rim) was good, maybe a bit too sweet for my taste. The KGB Will Wait For No One (Apple-infused Vodka, Muddled Cranberries, Ginger Simple Syrup, Ginger Beer and Cider) – I just had to try the wine with such a name. It was again a bit on a sweeter side, but quite tasty nevertheless. The wine list is small but offers a good variety, including some of the “local” selection, such as few wines from the Finger Lakes region. We started our dinner with a set of appetizers. Eggplant Rollatini (eggplant cutlets, ricotta, Grana Padano) had excellent seasoning, perfectly executed dish. Zepoli Chicken Wings (classic buffalo, roasted garlic, Parmesan) were delicious, done at the level when you want to lick your fingers after you eat one; let’s not forget an excellent, classy presentation. Marinated Beef Tips (24 hour marinated beef tips, smoked pepper aioli) were literally surprising, as cooking the beef to such a level of tenderness is not easy – excellent, tender beef, melt in your mouth dish. Our next comfort group included Pizza and Pasta. Margherita (San Marzano tomatoes, basil, fresh mozzarella) was very good; Roasted Butternut Squash (Sage, red onion, kale, mozzarella) not only was tasty, but it was very unique – when was the last time you had a pizza with roasted eggplant on it? This was definitely a first for me. Zepoli Ravioli (whipped ricotta filling, wild mushroom cream, topped with arugula and crispy pancetta) were excellent, rich and generous; Cavatelli (broccoli rabe, sausage, roasted fennel, marinara) was also tasty, and one of my favorites – pasta with sausage is one of my favorite ways to eat pasta. We closed the main part of our dinner with two of the entrées. Herb Roasted Chicken (free range chicken, red bliss potatoes, baby carrots, peas, pan jus) – spectacular. Everyone who thinks it is easy to prepare a delicious, juicy, not dry and boring chicken is dead wrong – delicious, tasty chicken requires great skill. Bar Zepoli perfectly delivered the deliciousness in one composed dish. If this is not the comfort food, I don’t know what is. When it comes to Braised Short Rib (parsnip puree, sautéed kale, roasted potatoes), short rib might be my favorite cut and preparation of beef – this dish was outstanding, fork tender and flavorful. Sugar is definitely an element of the comfort. Dessert, anyone? Raspberry Tart (fresh strawberry, caramel sauce, raspberry coulis) was very good, not too sweet. Chocolate Polenta Tart (vanilla ice cream, chocolate sauce, fresh raspberry) was definitely unique – never had polenta-based sweet dishes before. Cheese Cake Crème Brulee (creamy cheesecake, caramelized sugar, marinated strawberry, whipped cream) was again another unique cake, combining two of the classics – Cheesecake and Creme Brulee. last but not least, Cinnamon Zeppole (Italian donuts tossed in cinnamon sugar, with side raspberry sauce) was a perfect finishing note to an excellent dinner. What are your favorite comfort Italian dishes? Cheers! For those of us who like to travel, why do we like it so much? More often than not, the travel itself is not fun – the stress of the airport, cramped planes with the seats getting narrower by the minute, airline food – it leaves lots to be desired. But once we arrive, it is the experience that makes all those travel troubles worth it – the culture, the people, food, wine – this is what we are looking for. Visiting Australia is squarely on my “bucket list” – I’m sure one day I will be able to experience the culture. 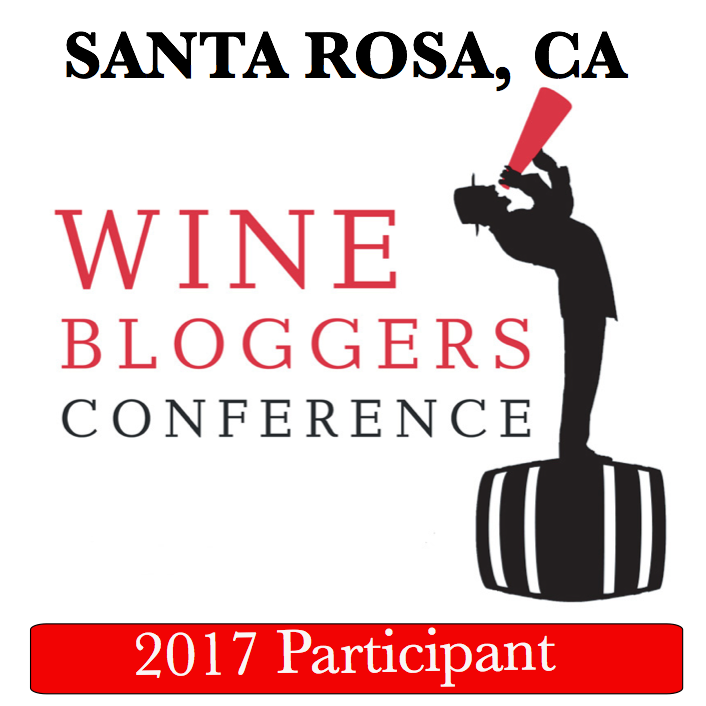 I had been drinking Australian wines for a long time – this doesn’t replace visiting the winery, but it is as close as it can get. When it comes to food, the only place in the USA which can be associated with Australia is a chain of Outback Steakhouse restaurants – they constantly run the ads on the TV, with supposedly an Australian-accented narration – this is as much of the Australian experience as you can get there (the voice in the ad might be the most authentic part of experience). And then Flinders Lane Australian restaurant opened in Stamford. Of course, when I was invited to visit, I was excited – not as much as if it would be an actual country, but still. I would guess the name of the restaurant takes its roots from one of the oldest streets in Melbourne, Flinders Lane, which now hosts a variety of little shops and the restaurants. What authentic Australian food should you expect to find at the Flinders Lane? I actually know very little about authentic Australian food, so let’s see: Kangaroo? Check. Vegemite (have you heard of it? I will explain later)? Check. That’s about all I know, so let’s just talk about our experience. You have to start the evening with a cocktail, right? Well, even if you disagree, it is still right – and this is what we did. Fresh Grapefruit Mule (Absolut Elyx Vodka, Cucumber, Grapefruit, Lime, Bundaberg Ginger Beer) was very refreshing. Floral Cucumber Margarita (Blanco Tequila, Elderflower, Cucumber, Thai Chili Tincture, Lime, Agave) was different but equally refreshing. Limoncello Collins (Villa Massa Limoncello, Vodka, Lemon, Club Soda) – just look at that presentation, isn’t it too pretty to drink? Nicely lemony and very tasty overall. If we are talking cocktails, we have to talk about the wines. The wine list is not very large, but diverse and versatile, with reasonable prices and a good selection of wines by the glass. I also was happy to see the Australian wines on the list (which is not common for the most of the restaurants, but hey – if not at Flinders Lane, the Australian restaurant, where else?). I had prior experience with Hewitson Baby Bush Mourvèdre, and this 2014 was outstanding – soft, round, supple, perfectly balanced – it was an excellent accompaniment to our dinner. We started with Arancini (black garlic mayo, pecorino cheese), which were outstanding, very good texture and flavor. Pork Sausage Rolls (sambal mayo) was more of a traditional Australian style (at least this was my understanding), and a very tasty bite. And Heirloom Tomato, Burrata, Truffle Soy dressing was perfectly presented just for the single bite – and there are very, very few things which are more delicious than a combination of fresh burrata and heirloom tomato. Yum! Next, we had Tuna Tartare (soy mirin dressing, cucumber, plantain chip) – I’m extremely particular about my tuna tartare, and I have to honestly say that this was not bad, but not my favorite. Something was not matching in the flavor profile – for my palate, of course. Pork and Veal Meatballs (ricotta salata, grilled baguette) were delicious, crispy on the outside, but airy enough inside. Truth be told, scallops are probably my most favorite choice of protein. If there is a scallop dish on the menu, there is a very, very good chance that that would be the dish I would pick. Diver Scallops (cashew chili relish, hijiki) didn’t disappoint – perfectly cooked, perfectly spicy – very tasty. And then the Kangaroo salad (chili lime dressing, cilantro, crispy garlic) – my first taste of the kangaroo, lean and gamey taste profile, rather as expected, overall quite tasty. Branzino is another one of my favorites, and this Pan-seared Branzino (sesame ginger broth, bok choy) was excellent – delicious, great flavor combination, might be the tastiest dish of the whole dinner. Of course, you have to have the Australian lamb if you are visiting the Australian restaurant – Braised Lamb Gnocchi (tomato, pecorino) had a nice flavor, but very lamb-y in your face, which is generally not my thing, but overall this was not a bad dish. We had Lamington (traditional Australian dessert), Sticky Date Pudding (another traditional Australian dessert and Chef Brad’s grandma’s recipe), Carrot Cake (Chef Brad mom’s recipe) and Pavlova – don’t ask me for individual notes, please – they were all one better than the other, absolutely delightful, and a great finish to our dinner. Here you are, my friends, I hope I didn’t make you too hungry – while you are contemplating your trip to Australia, you can come to Flinders Lane here in Stamford to get a little taste of it now. No boarding pass required. Cheers! If I will describe a restaurant as “classy rustic”, would that make sense to you? Can you walk into the restaurant and feel that time and place all of a sudden changed on you? The modern, fast, noisy city disappeared, and instead, you find yourself in the cozy shack up in the woods? That’s what Tavern 489 does to you. You walk in and instantly taken by the ambiance – no detail of decor is left to a chance – every element is used to create that tavern feel, the rustic ambiance – and it puts you in the right mood. We visited restaurant back in May, when it was only opened. Eric Monte, a well-known restaurateur in Stamford, CT and an avid wine collector, put together a special dinner menu for us, with all the dishes paired with the different wines. And not only the wines. Tavern 489 is the only restaurant in Connecticut which serves Moosehead Lager, the beer made at the oldest Canadian brewery (founded in 1867) – and Moosehead Lager was our first pairing of the night. Before we get to food – yes, of course, there was a cocktail to start the evening. Tavern 489 is located on the street called Glenbrook Road, one of the oldest streets in Stamford – how you can pass on an opportunity to taste the Glenbrook Mule cocktail (which was very tasty)? Our first dish was Venison Balls (red wine green peppercorn sauce), served with the Moosehead Lager. The balls were nicely spicy, and the beer was working perfectly with the dish. And what I loved the most was the presentation – perfectly fitting for the tavern food. Next up was Cold Spring tomato Soup, and we also switched to wine to continue our dinner. Our first wine was 2013 Les Costiéres de Pomerols Picpoul de Pinet AOP – touch of honeysuckle on the nose, clean, simple palate, tart. The wine didn’t work with the soup (how many wines do? ), despite the fact that the soup was very tasty. But it perfectly complemented Taunton Bay fried oysters (lemon, tamarind, curry, tomato sauce), which were delicious and again, beautifully presented dish – we eat with our eyes first, and the oysters were a pure delight on the plate. The food continued with the selection of the burgers – Bison Burger, Blackened Angus Burger w/Blue Cheese and Tavern Burger w/Pesto Truffle – my favorite was the Blackened Burger – great flavor, and of course it is hard to resist a blue cheese topping. With the meat, the new wine showed up – this time red, 2010 Grand Palais Bordeaux Supérieur – typical Bordeaux nose, green bell peppers, supple palate, good balance. This wine perfectly paired with my favorite dish of the evening – Charred octopus (Kidney bean, tomato, shallots, garlic, parsley, pomegranate chimichurri dressing) – this dish had both perfect finess of flavor, and just a rustic, homey, comfort food feel – simply a wow. Our main course was a true carnivore dream and a masterpiece in the presentation – Dirty Tomahawk steak – bone-in thick ribeye steak (served with Chef Suggestions – potatoes, broccoli rabe, bacon-wrapped asparagus). Definitely a treat, and if you are into the meat, that is your dish. Another wine was served with this dish – 2012 Shooting Star Blue Franc Blaufrankisch Washington State – generous, rich, brooding – delicious wine overall. The wine was unique and different – how often you get to drink wine made in the USA from the Austrian/German grape such as Blaufränkisch? Definitely a treat – and an interesting story on the back label. And finally – the dessert – very tasty Chocolate Mousse, light and delicious. This was the end of our evening of delicious food, music, and wine – and I highly recommend that you will head over to the Tavern 489 and check it out for yourselves. You can thank me later. Cheers! What makes the restaurant visit “fun”? Good company and good conversation? Check. Good food? Check. Good drinks? Check. Good music, preferably live? Check. The view? Would be nice. Check. Okay, now that we have the magic formula, I have a place for you, where you will be able to mark all of the above check boxes (well, you are in charge of your own fun company – can’t help you there) – Sign Of The Whale restaurant in bustling Harbor Point neighborhood in Stamford, Connecticut. 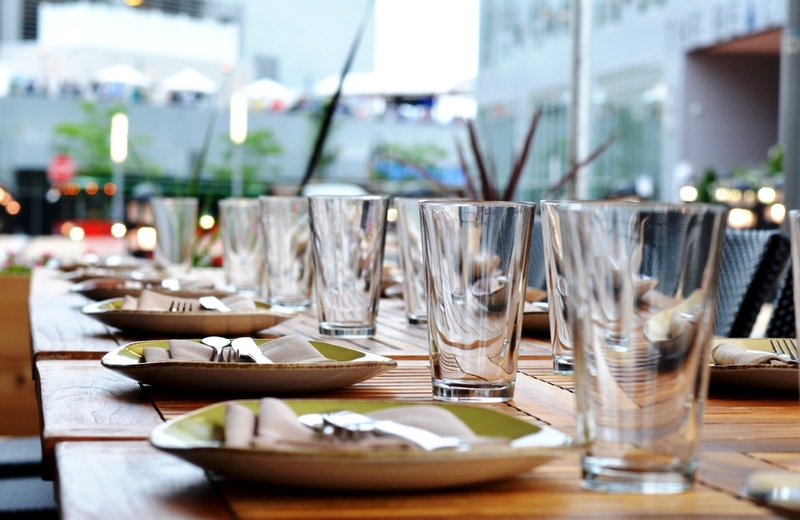 From the moment you walk in, you are greeted by spacious and noisy place – the noise is a sign of any happening restaurant where people like to stop by after a day of work, have a drink and discuss… whatever they feel like discussing. And let’s talk about that drink. The restaurant offers nice selection of cocktails. We had an opportunity to try a few – Raise the Roof (Silo Barrel Aged Gin, Apple Bite Cidre, black walnut bitters served over ice) was nice and refreshing (gin’s aromatics was somewhat dialed down though), Strawberry Mule (Leblon Cachaça Rum, lime juice, agave nectar, strawberries, ginger beer. Strawberry Garnish) was very pleasant and Spiked Fall Tea (Deep Eddy Sweet Tea Vodka, Cranberry vodka, lemonade, sugar rim, lemon garnish) packed a nice punch. I have to also mention the wine list at the Sign of the Whale. While it is rather on the short side, it sports an excellent selection of the interesting wines. I had a glass of 2013 La Galope Rosé Côtes de Gascogne – fresh, tart strawberries profile with great acidity. Another wine which I liked very much was 2014 Insurrection Cabernet Sauvignon Shiraz Blend South Australia – balanced fruit, overall nicely restrained and well complementing our steak (see below). And then, of course, there was food. Our selection of the appetizers started from the Shrimp Skewers (old bay seasoning) – perfectly cooked, excellent flavor profile. Coming right after was Seafood Tower (clams, shrimp, lobster, two types of local oysters) – presentation alone makes you salivate profusely.Lobster and shrimp had perfect texture, and oysters were delicious. Our dining experience continued with Chopped Kale Salad (Tuscan and Baby Kale tossed in sesame vinaigrette, topped with oranges, avocado, fennel and cucumbers) – to say that it was one of the very best kale salads I ever had would be an understatement – perfect balance of flavors with crunchy texture; sesame vinaigrette was simply spot on. Next arrived Ahi Tuna (Ahi Tuna tossed in soy ginger sauce, served over avocado cream, topped with yuzu aioli, and served with wonton chips and wasabi) – again, excellent flavor, very tasty. Two more appetizers were completing first part of our dinner. Lobster Minis (Claw, tail and knuckle meat, lightly mixed with mayo, lime, lemon, and blood orange) were texturally good, however, the flavor was lacking for my taste. Fish Tacos (Haddock fried in tempura batter, with pineapple, apple and pickled red onion) had nice crunch on the fish, and apples with pickled onions were providing nice refreshing component. Not to be outdone, our main course followed, starting with Seafood Cavatelli (Little hollow pasta shells, tossed with Lobster, shrimp, chopped clams and capers in lobster cream sauce), which I can describe in one word – delicious. Our next dish, 16 oz Bone-in Rib Eye (Grilled, served with caramelized onions, Parmesan steak fries, sauteed spinach, chickpeas, shallots and house steak sauce) was easily everyone’s favorite at the table. Here my description will be even shorter – wow. Perfectly executed steak, triple-fried (!!) potatoes were amazing, house steak sauce was perfect, so all together was simply a wow. Our last main dish was Pan Seared Atlantic Sea Scallops (U-10 scallops served with vegetable orzo pasta salad, finished with a Blood orange beurre blanc) – it was perfectly executed both in presentation and the texture of the scallops, but what spoiled the dish for me was the amount of salt on top – just too much. And now, let me present to you the desserts! Remember I told you that today we are talking about concept of fun at the restaurant? So to make sure it is fun all the way, how about some adults desserts? Yep, you got that right – these would be the desserts which also have an addition of so called “adult beverages”. And I don’t know if any other place can do it better that the Sign of the Whale – even presentation of those adult beverages is an art form. More exciting desserts followed, like Ice Cream sandwiches, Adult Root Beer Floats and Seasonal sorbet. And for my ultimate happiness I can tell you that the regular coffee was excellent, which is more of a rarity nowadays. I hope I gave you enough reasons to go and check Sign of the Whale on your own. And if you will not – well, it will be your loss… Cheers! As a self-proclaimed foodie, I pride myself with having no favorite cuisine or a type of restaurants – when asked “which restaurant would you prefer for dinner”, my typical answer is “I eat everything”. It is true, of course, but may be not entirely. One example – Indian cuisine. This might be on the subconscious level, as one of my very first encounters with Indian food happened on the “Indian hot” spiciness level, which leaves some unforgettable scars on the uninitiated, but an Indian restaurant would not likely be my top choice given a list of possible dinner options. But again, as a foodie, I feel almost obliged to work over my own limitations, and keep trying different cuisines. Thus when I was invited to visit Tawa Indian Cuisine restaurant in Stamford, I saw a great opportunity to deep dive into the Indian cuisine once again and see what I might be missing. I loved the decor at Tawa – quaint and sophisticated, very tasteful. Nothing is really glaring at you that you are in an Asian restaurant, not even aromas in the air. Once the dinner started of course there was no question of what kind of food is in front of us. I will give you a detailed account below, but to describe the experience as a whole, I have to mention the perfect balance. The food had brilliant colors, and none of the dishes where shy on flavor – this is why I called this post “dazzling flavors” – but all the spiciness was balanced, it was like a perfect dance, where you mesmerized by the perfection of movement and forget the time. This was also explained by the Chef Kausik Roy – his goal was to present the variety of flavors of the cuisine of the vast country without overwhelming – and this was clearly showing in the food we had an opportunity to taste. This was my second encounter with Chef Roy, and I love the fact that I get to learn something interesting from him. Last time I was learning about curries, this time it was cilantro. It appears that cilantro is used in the 95 out 100 Indian dishes, so it is a very important herb. But what is interesting is how you use it. When I use cilantro, I would chop mostly just the leaves with a bit of the stems, and add them at the very end of cooking. But to extract the deep flavor, you need to use whole stems and simply cook with them from the beginning. Okay, let’s talk about our dinner. We started with the cocktails (yep, in Indian restaurant), and they were tasty. I generally don’t like overly sweet cocktails, and from the description I was a bit concerned that they might be – but both Watermelon Ginger Margarita (Tequila, Ginger, Watermelon Syrup, Dekuyper Triple Sec, Lime Juice) and Tawa Madras-Tini (Ketel One Vodka, Mango Juice, Dekuyper Triple Sec) were just excellent, not very sweet; Watermelon Ginger Margarita had very nice level of spicy heat with it. Tawa offers somewhat small, but well thought through wine list. We had 2013 Saint M Riesling Germany, which had a touch of sweetness and bright acidity, excellently complementing many dishes. We also wanted to have a red wine with the dinner, and I was very happy to find 2013 If You See Kay Red Blend Lazio IGT, Italy on the list – one of my perennial favorites, with great concentration of the dark fruit and good acidity, this was definitely an enjoyable wine. We started our dinner with Tawa’s Signature Tropical Mango Salad (Tropical mango, baby greens, Mango onion seeds dressing), served with a crispy naan – fresh and light, good way to start the dinner. Next up was Mulligatawny Soup (Yellow lentil soup, finished with coconut cream and fresh lemon), made with the vegetable broth and finished with a touch of yogurt. Mulligatawny actually means “pepper water”, so it is supposed to be very spicy, but this is not how Chef Roy does it. Soup was delicious, and a double treat considering cold and rainy weather outside. Next dish was Aloo Tikki Chaat (Indian spiced potato patties topped with garbanzo beans, tamarind chutney, raita & roti crisps) – great spices, delicious and then Coconut Pepper Shrimp (Lightly battered shrimp, smoky black pepper, chutney mayo), with that chutney mayo been pretty spectacular. Last one of our appetizers, Indo Chinese Lasuni Gobi (Crispy cauliflower florets tossed with tangy tomato garlic sauce and spring onion), not only had an amazing crunch, but also texturally was indistinguishable from nicely cooked meat. Wake me up at any time and offer me this dish – I would be super-happy. Our dining extravaganza continued with selection of Naan, an Indian bread which is one of my absolute favorites (I have to always stop myself from devouring the whole “basket”), following by Kebab Platter. Grilled pieces of chicken, lamb and salmon were colorfully presented on the wooden board, and the taste was on par with the presentation – tender and flavorful. That’s all I have for you, my friends. This was a great journey into the world of Indian cuisine, and with the masterful execution by Chef Kausik Roy, I can’t recommend Tawa highly enough. Definitely a deviation from the every day food for many people here in the US, but I’m sure your taste buds would appreciate a different flavor, and you will enjoy the experience. And if you are already accustomed to the flavors of the Indian cuisine, come and taste what the Tawa has to offer. Cheers! No, “Bistronomie” is not defined in Merriam-Webster, not yet anyway, but I expect that you have no problems understanding its meaning – a Gastronomy experience in a Bistro setting, right? It also means that you can eat dessert when you want, but we will talk about it later. Before we continue, I have to give the usual warning – there are lots of food pictures ahead, proceed at your own risk (not sure if “risk” is a right word, but I’m sure you got my point). Welcome to the recently opened Noir Restaurant in Stamford, Connecticut, which identifies itself as an American Bistronomie. The restaurant looks nice and cozy from the moment you enter, sporting dark quiet decor with interesting paintings on walls – your brain tells you “ha, that looks interesting”, putting you into the right mood, or rather anticipation, for the food to come. We visited restaurant for Sunday brunch, so what do you typically start your brunch with? Let me rephrase this: when greeted with “what would you like to drink” as you get situated [during brunch], what is the first thing which comes to mind? You might be better than me, but my brain stops at a very pedestrian “mimosa!”. The mimosa was very tasty, but then I actually noticed the cocktail menu – small, but each item on the list looking very intriguing. I had an opportunity to try a number of cocktails and they we all very creative and delicious – and needless to say, visually appealing. I can’t even name a favorite cocktail – well, may be 3 favorites – The Jazzy Latina, The Cabo Mule and The Piscomatico – as I was going from “wow” to “excellent” and back to “wow”. Our brunch started somewhat traditional with Devilled Eggs (caper aioli, bacon, pimentone) – I love devilled eggs, so I really had to contain myself to behave (meaning: not to move half of the serving dish into my plate), also this was just the beginning of the meal. The dish was very tasty, and as we eat with our eyes first, I can’t help not to commend the presentation. Our brunch continued – first surprise – with Fresh Fruit with Yogurt. A peculiar side note: few days ago, I read an article suggesting that we eat our fruit all wrong at the end of the meal, which is not right for our digestive system, and instead, we should start our meal with the fresh fruit. I can’t really comment on that, but I can tell you that the fruit was nice, fresh, ripe and tasty. Next up – Biscuits and Gravy (Homemade buttermilk biscuits, savory sausage gravy). I don’t know even how this works – I don’t have strong cultural connection to the South, where this would be a typical dish – but I love fresh biscuits and savory gravy – this dish was superb. The dish which followed was Pastelon (sweet plantains, seasoned beef, mascarpone cheese), and it even prompted me to do a little research – it appears that “Pastelón is a sweet and salty Puerto Rican version of lasagna or casserole”. I can easily see the similarity with lasagna – the dish had nice layers. I have to also say that it was not overly sweet. At this point we are in a middle of our meal, and the next up is … remember what I told you before about the Bistronomie? Well, it is not that it is mandatory feature, but yes, we arrived at the dessert in a middle of our meal! First we had Monica’s French Toast (caramelized challah bread, Grand Marnier, browned butter), which was delicious, and it was followed by Banana Foster Griddle Cakes (spiced pancakes, caramelized bananas, praline pecans) which was “please give me a big spoon and everybody leave the room”. Done with dessert, back to savory! Eggs Benedict, anyone? Isn’t it a classic brunch dish? Yes, I think so. And topped with a little crab? Yes, I know I’m now talking. Crab Eggs Benedict (jumbo lump crab, toast English muffin, hollandaise) – outstanding. Following an American classic (I always think of Eggs Benedict as a French dish, but it was actually created in the USA) was another Southern specialty – Crispy Chicken and Waffles (home fried crispy chicken, jalapeño maple syrup). I have to tell you that chicken was crispy and tender, and jalapeño maple syrup was simply a stand out. Then we were served Short Rib Hash (slow braised short rib, home fries, fried egg) – isn’t fried egg makes everything look and taste better? I think it does. Overall, this was very tasty dish with one little gripe – the short rib itself was too salty – for sure for my personal taste. Finishing up on the high note was one last dish, yet another Southern classic – Shrimp and Grits (Cajun Herbed shrimp, creamy grits). While shrimp were perfectly cooked and very tasty, the creamy grits were simply out of this world. All in all, this was a spectacular meal, and I can’t recommend Noir Bistronomie high enough as location for your next dinner, brunch or simply a place to have a drink at. And before we part, I also would like to thank Chef Francisco Ciciliano who came to speak to us for a few minutes at the end of our food journey. And of course I have to acknowledge and thank the staff at Noir Stamford for all the wonderful drinks and for taking great care of our group. So, what do you think about the Bistronomie? Are you going to ask for it now by name? Cheers! I don’t think I ever confessed my love to the city of Stamford in this blog. Meanwhile, it is the city where I live for the past 20+ years, and it is one of my absolute favorite places in the US (yep, I’m biased like that). Compared to many towns of the same size (about 128,000 people live here), it has very unique and different architecture, beautiful downtown, and lots of areas directly adjacent to the water – the Atlantic Ocean (Long Island Sound, to be more precise). You don’t have to take my word about “unique and different” – come for a visit one day. Over the past 5-7 years, number of areas in Stamford completely changed their appearance, especially at so called South Side (this is the area mostly by the water). The industrial landscape of the small repair and hardware shops and construction companies was replaced by the beautiful apartment buildings and brand new stores, such as Fairway Market, with obviously lots of people now living in the area. So all those people have to eat somewhere, right? Besides, Connecticut is considered one of the primary “foodie” areas, so it is a given that the newly developed areas attract new and interesting restaurants. This is exactly what I want to present to you today – recently opened (second half of 2014) Paloma Restaurant at Harbor Point district of the city of Stamford, a brand new development which is still sporting lots of construction cranes as the major decoration. Paloma is a Latin-themed restaurant, part owned by the celebrity chef Aarón Sánchez. We visited restaurant with the group of bloggers, so as usual, I would like to share with you our experience (don’t continue reading if you are hungry, please – I’m not responsible for any excessive drooling and its consequences). We started with cocktails before the dinner. Allegre Hemigway (Avion anejo tequila, atlantico reserve rum, lime, ruby red grapefruit, maraschino liquor) was nice, may be somewhat simplistic, but refreshing enough. The Bacon Old Fashion (the duke’s baconized bourbon, simple syrup, bitters) was somewhat disappointing. My problem is that if it says “bacon”, I need to taste that bacon – this was not the case here. It was definitely very potent, but I was unable to taste any bacon. If anything, I would probably serve this cocktail with a piece of bacon in it – well, I finished it anyway. You know that I have to talk about the wine next. The wine list at Paloma is short, but well constructed with a good international selection of wines, both by the glass (generous 6 oz pour), and by the bottle. 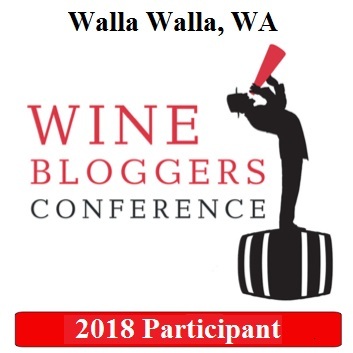 For the white, we had 2013 Adelsheim Pinot Gris Willamette Valley Oregon – bright flowers and white stone fruit aromatics on the nose, dry, crispy and restrained on the palate. For the red we had 2013 Casas del Bosque Cabernet Sauvignon Gran Reserva Maipo Valley Chile – typical mint and black currant aromatics of Chilean Cabernet, velvety texture, perfect balance, dark fruit with a touch of herbs, full body – one delicious wine with a great QPR ($41 at a restaurant). I can tell you that Casas del Bosque is becoming one of my favorite Chilean producers – I recently had their Rosé, Carmenere and now Cabernet Sauvignon – all excellent wines. Before we get to the food I have to mention that the wine list at Paloma greatly extends into the Bourbon, Scotch, Tequila, and my perennial favorite, Mezcal. I should’ve probably mentioned that as an “after-dinner” element, but while we are talking about all the drinks I would like to make sure you will be aware of that. I had one of the beautiful Mezcals from Del Maguey, which at $12/pour was an excellent value – and it was delicious. If you like this type of drinks, don’t miss it when you will visit Paloma, as they probably have the best list in Stamford in both selection and the prices. Now, to the food! We started with Shrimp Tempura Tostadas (creamy aji mirasol, mango salsa) and Crab Tostadas (chile arbol aioli, avocado puree) – nice single bite appetizers, good flavor and very easy to eat. Our selection of appetizers continued with Lobster Ceviche (passion fruit, habanero sauce) – pleasant, but too sweet to my taste. Next, Tai Tiradito (snapper crudo, aji rocoto sauce, crispy hominy) – the snapper had nice crunch to it; overall, this was very spicy, but refreshing. Albondigas (meatballs, chipotle broth, mint, queso cotija) had very good texture, nicely done. But to be entirely honest, Mexican Street Corn (chipotle crema, queso cotija, herbs) was one of my two most favorite appetizers – an excellent array of flavors, very delicious. Combination of spicy chipotle crema and cotija cheese was just spot on. And the Queso Fundido (huitlacoche, wild mushrooms, corn tortillas) was another favorite – there was not a morsel of a crunchy cheese left in the skillet – everyone at the table loved it. Next it was the time for the main course. Cuban Style Chicken (Cuban marinated roasted chicken, pickeled salad, tamarind chicken fried rice) was perfectly cooked, with lots of flavor in the meat – it was definitely well marinated. Fried rice was excellent, and the sauce was marrying all the dish’s components perfectly together. Braised Short Ribs (ancho-cacao rub, seasonal vegetables, horseradish gemolata) was one big chunk of beef – fork-tender and very flavorful, one of the definite highlights of the evening. Camarones Mojo de Ajo (jumbo shrimp, chile de arbol butter, crispy grits cake) were first of all beautifully presented. The shrimp was perfectly cooked, but the real star of the dish was the crispy grits cake, as it had an excellent texture and flavor profile. Garganelli Pasta (chorizo, cauliflower, grilled escarole, tamarind reduction) was a comfort food – homey, satisfying, delicious; something you can poke at for a while, just trying to stretch the pleasure. Now the last but not least – desserts! First, we had Churros (dolce de leche and agave-vanilla crema) – an absolutely delicious rendition of one of my favorite treats; a different shape, but a very familiar taste. Cheesecake (salted caramel, cherry chunk cookie cumble, ice cream) also had an unusual presentation, and the salted caramel component made it into a perfect after-dinner treat. On the subject of the liquid desserts I would like to once again mention the excellent drinks selection at Paloma – from the liquors to bourbons and on to the mezcal, this is definitely something not to miss. Overall, it was definitely a very good meal, and I’m glad we have another interesting dining option in Stamford. Hope you enjoyed the pictures. Cheers! I’m sure that everyone involved in the craft, no matter what it is, has passion for what they do. Sometimes the passion simply shows through their work. But every once in a while we come across the person who simply exudes that passion, readily sharing it with the world through the words and deeds. In this series (as an engineer, I like to organize things), which I call “True Passion”, I plan to share my encounters with such a True Passion. Can a visit to the pizza restaurant blow your mind? I mean the mind first of all, not even the palate? In the nation raised on Pizza Hut and Little Caesars, pizza is such a no-brainer, isn’t it? 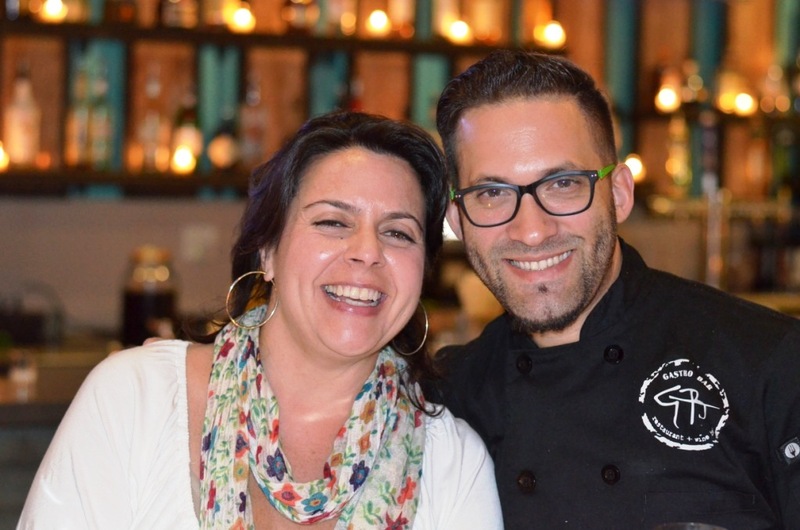 We (bloggers) got together for the dinner at Amore Cucina & Bar in Stamford, Connecticut. 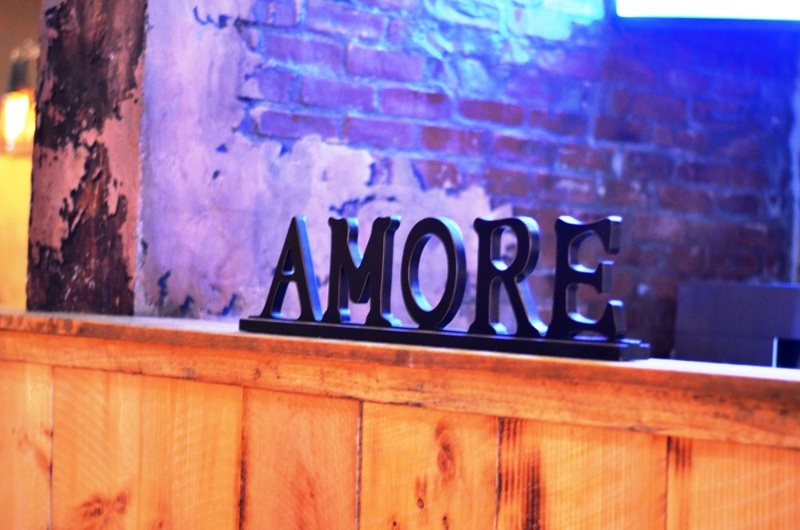 Amore has an interesting story – in essence, it was the second oldest restaurant in Stamford, originally opened in 1975. In 2014, the original owner of the restaurant sold it, so we were visiting a new reincarnation of the Amore. As we were finishing our customary chat and the round of cocktails before the dinner, the man walked in with a glass jar in his hand. Bruno DiFabio, Six-time World Pizza Champion and a new owner of Amore restaurant, came to share with us his passion about the … dough. Look, I love bread and all the things made out of dough, but I never even tried to think about dough as something which can solicit emotions (no problems, you can call me whatever you want, I’m still a student of life, one moment at a time). The dough for me was something you can quickly put together, or maybe buy at the local supermarket for a $1 for a big plastic-wrapped ball. Make no mistake – dough can be an object of passion. Have you heard of the mother dough, essentially a dough which is always alive and used to start a new batch of dough every day? How about foraging your own wild yeast, from the different and totally unexpected places, every morning? How about super-digestible pizzas, which are a rave now in Europe – heard about those? When you meet a person like Bruno, you realize how the true passion looks like. And don’t discount the Pizza passion – having both gas and wood-fired oven in one relatively small restaurant? I think it really means something. Well, this is the post about Amore restaurant, so as much as I would like to continue talking about our conversation with Bruno, I want to move on to the food, so I can inundate you with pictures. But if you want to know more about Bruno, here is the link – besides, visiting Amore restaurant might be a right thing to do as well. Okay, let’s talk about our dinner, which was a true demonstration of the Bruno’s Pizza magic, and mastery of the Chef Jarred, who joined Bruno after his previous gig at Washington Prime. As usual we started from the cocktails. I had French Quarter (G’Vine Floraison Gin, St. Germain, Green Grapes, Basil Leaves, Lemon Juice, Fever-Tree Tonic), which was nice and refreshing. The the food started arriving on the tables, in multiple sets, above and beyond our expectations. We started with the Bruno’s Bread w/ Sunday Sauce – very simple, but delicious. By the way, according to Bruno, it is a myth that you have to cook tomato sauce for hours and hours – you can pretty much develop the flavors within an hour, there is not much else you can achieve with the extra cooking time. New Haven White (little necks, Amore bacon, house mozarella, smoked lemon juice) – this pizza is a tribute to the Connecticut staple, Frank Pepe‘s White Clam Pizza, and it was excellent. For the Queen (San Marzano, flor di latte mozarella, pecorino romano, basil, local egg) – while we think that adding egg to many dishes is a new discovery in the US, it appears that Italians had put an egg forever on Margherita Pizza – I love that food learning. The pizza was outstanding. The Holy Cheesus (House Mozzarella, parmigiano reggiano, pecorino romano, fontina, burrata) – that was simply a Wow. No further comments. Juliet (Houze Mozzarella, gogonzola dolce, fig jam, prosciutto, agrodolce) – excellent, great combination of flavors. Arugula and Beet Salad (Goat cheese and candied walnuts) – what is unique about beets and arugula? How about beets which were braised in veal and chicken stock, and then pureed? This is not your typical beet salad, isn’t it? Meatballs (Sugo, house ricotta, agrodolce) – these were okay, a bit dense. Octopus Puttanesca (Tomato, Sicily olives, garlic, n’duja sausage, capers) – this was excellent, the capers were deep fried, very nice heat overall. Tuna Crudo (Calabrian chiles, toasted pumpkin seeds, red onion, torn parsley) – outstanding. Shrimp & Polenta (tomato, house bacon, polenta) – that sweet polenta was just something else – another wow dish. Lasagna Balls (Bolgnese and sugo) – forget arancini – this is what you really want to eat. Perfect crunch, and you can taste real lasagna, inside and outside. Yep, another wow. Chicken Scarpariello (house sausage, peppadew, garlic, Italian polenta, green shallot) – spectacular flavors, really an excellent dish. Whole Branzino, roasted and fried – wow! Pasta Carbonara (linguine, guancalle, parsley and egg) – and wow again – so fresh and so light, you just can’t stop eating it. Budino & Fat Pizelle (butterscotch, whipped cream, berry reduction) – a delicious concoction. Yes, this was the end of our evening. I hope you were not too hungry before you read this post – sorry, forgot to give you my usual warning. 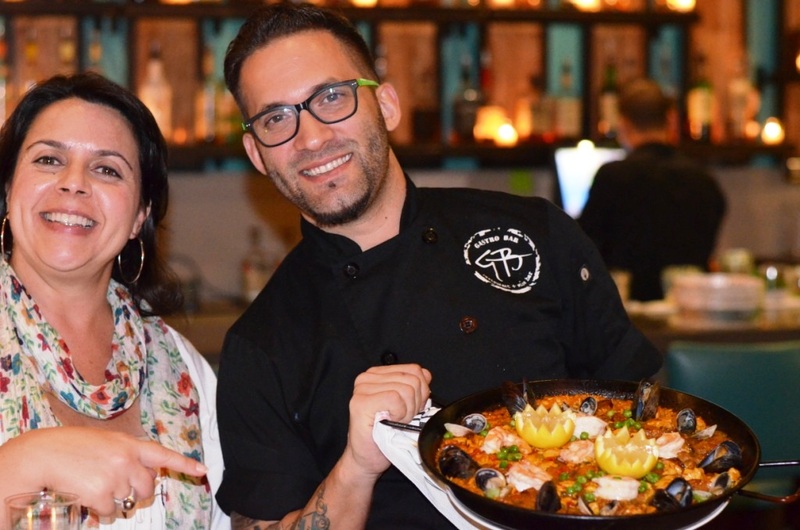 If you are local, or if your travel will take you to Stamford, Amore Cucina & Bar might be your little neighborhood gem… Until the next time – cheers! Stamford, the town where I live, is a vibrant, “alive”, modern city, with no shortage of the restaurants (according to the Trip Advisor, Stamford, a city of about 123,000 has 390 restaurants – I believe that accounts for McDonalds “restaurants” as well, but still). And nevertheless, when I think about new interesting restaurants or when I’m asked to recommend a restaurant in Stamford, I almost start mumbling – especially, if the request is for the new restaurant. I can easily recommend places in Norwalk and other towns near by, but Stamford is always a challenge. This is why I was very happy when I was invited to yet another bloggers dinner at the new restaurant in Stamford, called Gastro Bar. I like it when the name of the restaurant becomes part of the experience, as it builds anticipation. Think about it – when you are planning to visit a restaurant called “Corner Cafe” – does it create any level of expectations and excitement? Not unless you do the research and figure out what people think about it and what is served at such a restaurant. At the same time, when you hear the name “Gastro Bar”, such a name right away creates a feeling of excitement, as it hints at the upcoming gastronomical experience. Gastro Bar is located in one of the busiest restaurant enclaves in Stamford – Columbus Park. From the street you walk into the nicely decorated space – it has charm, but doesn’t overwhelm. The front wall of the restaurant is pretty much made out of glass, so even while you are inside, you have a feeling of the open space and feel connected to the street outside. Bar is very substantial, and looks very appropriate for the place which has the “Bar” as part of the name. As usual, we started our visit from a few drinks. The cocktails list was small, but the drinks were outstanding. Slow & Low (Slow & Low whiskey • muddled oranges & lemon • ginger beer) had delicious fresh orange, very refreshing. Gastro Mule (Hendricks Gin • pineapple juice, triple sec • St. Germain • Rose wine) was my favorite – I really don’t like sweet cocktails, and this was a perfection – very tasty and again perfectly refreshing. Wine list had a good selection, mostly focused on California and Italy. We ended up choosing 2011 Justin Cabernet Sauvignon Paso Robles – the wine was rich, with dark fruit and tobacco notes, beautiful depth and excellent balance; this was definitely a spot on selection for our dinner. And then there was food. We started with the Fried Calamari (Smoked Aioli) which had a very good texture. Next appetizer was Oysters (Crispy oysters, avocado, pureé, grapefruit & radish), which were deep fried and served in a very unique way, with avocado and grape fruit. We had two pizzas, which were more of a tart style, with a very think and crunchy crust. Fig Pizza (goat cheese, 10 year balsamic, prosciutto, arugula) was delicious with large chunks of prosciutto and fig wonderfully balancing the goat cheese. Mushroom Pizza (mushrooms, bacon, fontina) was outstanding, with each ingredient contributing its own flavor profile, and every bite been cravingly delicious. Out entrée started with Panzotti (butternut squash, toasted almonds, brown butter), delicious homey pasta, a perfect comfort food. Baked King Salmon (horseradish, beets, whipped potato, braised celery) was outstanding all the way. While salmon was perfectly cooked, for me the stars of the dish were vegetables – sweet beets and braised celery were just spectacular. Paella (clams, shrimp, chicken, mussels, calamari, sweet peas, chorizo, saffron rice) was excellent, great flavor and texture, very well executed. After all this food, I’m very glad that dessert was of a reasonable size. The Cheesecake had very nice density – not too hard, but not easily falling apart either. And as I like all the things coffee, the Espresso Crème Brûlée was just a wow finish to this outstanding meal with its clear coffee profile. As usual, a big thanks to the Executive Chef Fernando Gomez, and I’m also glad that I had an opportunity to include into the picture our tireless guide to all the culinary extravaganza – Lin Kavanagh. We are done here, folks. I hope I didn’t make you too hungry. And I’m also glad that Stamford now has restaurants such as Gastro Bar, where classic perfectly mingles with innovation and creativity. Cheers! Disclaimer: I visited restaurant as a guest of the management. All opinions are my own.